Alex Jones was joined on air this week by investigative reporter Ed Haas to discuss an important story he has broken concerning direct evidence of Israeli prior knowledge of and possible complicity in the 9/11 attacks of 2001. Haas details in his expose how in October 2000, approximately 11 months prior to September 11, 2001, a former Israeli Defense Force member and veteran of the Yom Kippur War overheard a conversation at the Gomel Chesed Cemetery, located in Newark, NJ., concerning the attacks and spoken in Hebrew between three men. “The Americans will learn what it is to live with terrorists after the planes hit the twins in September.” Hass's contact said he heard one of the men say. After 11 months of desperately attempting to alert the authorities and being systematically ignored all along the line, the contact watched in horror as the attacks unfolded exactly as he had overheard. Haas revealed on air that he had been asked by a reader to contact the source, who has asked to remain anonymous for fear of his own safety, as he had in depth information about prior knowledge of the attacks and no one would listen to him. "I approached this individual as if his story was BS, you know that's kind of how I had to approach it, is this guy might be a nutcase, let's follow through though and see if his story starts to have merit, and it did. I reached a point where I felt as though this guy has some information based on his documentation and it smells like more cover up to me." The source also reported to Haas that he overheard one of the three men say, “The Arabs are so stupid. They don’t even imagine that we are using them.”. Could this be a reference to the 9/11 hijackers? It certainly fits other evidence that they, or their doubles/namesakes depending on which line you take, were intimately known to US intelligence and were being used as patsies. Haas has received copies of letters that his contact had received from the FBI after emailing and calling to tell them he had important information to share. A first letter advised the source to contact the Newark FBI division which he did several times with no response. Upon writing to the FBI a second time, a further response informed the source that the FBI would not be able to do anything on his behalf. On the same day the second letter was received, three months prior to 9/11, two agents from the Newark division visited the source. Without a guarantee of protection he was unwilling to tell them everything he knew. However, he did tell the agents that there would be an attack in New York City and airplanes would be used. Haas suggests that it is telling that the source was asking for protection, fearing that he had inside information on some form of Israeli intelligence operation, and the FBI was advising him to contact his local cop. The source told Haas the the Newark agents seemed rather annoyed that the higher echelons of the FBI were outright rejecting to receive information and offer protection. We have previously highlighted how many other divisional branches of the FBI were hindered or prevented from investigating red flags and warnings BEFORE the attacks of 9/11. We have also specifically highlighted the Israeli forewarnings, prior knowledge and possible involvement in 9/11. We have gone over these issues so many times in the past that we now get accused by newer readers and critics of ignoring them and somehow protecting Israeli intelligence. In truth we were talking about this stuff hours after the attacks took place and for years in the aftermath. The source's story suggests, as he himself believes, that the real perpetrators of 9/11 may have been a conglomeration of intelligence agencies, involving Mossad. He believes that there may even may a direct conection to the story of the Israeli spy ring and the five Israeli 'tourists' arrested on September 11th 2001 after they were seen in position on nearby rooftops before the planes hit and celebrating thereafter. Even Senator Graham, on the Intelligence committee after 9/11, has stated that there is evidence that suggests the attacks were funded in part at least by a sovereign government. This information has been classified. We also know that the head of Pakistani intelligence, the ISI, wired $100,000 to the lead hijacker before the event. "What made it so fascinating was that I decide OK I'm going to start trying to confirm this guy's story, once I confirmed that the [FBI] agents existed. I mean some of this story, if you think about someone making up a story, identifying FBI agents isn't... you know, it's not like when you go into your local police force website and they'll have pictures of all the police officers, you know identity of agents is something that he would have had to go to great lengths to fabricate." Last week Haas contacted the FBI north division and was able to confirm the identity of Agent Robin Gritz and Agent Andrew Stengel and that these agents had met with his source on June 26th 2001. 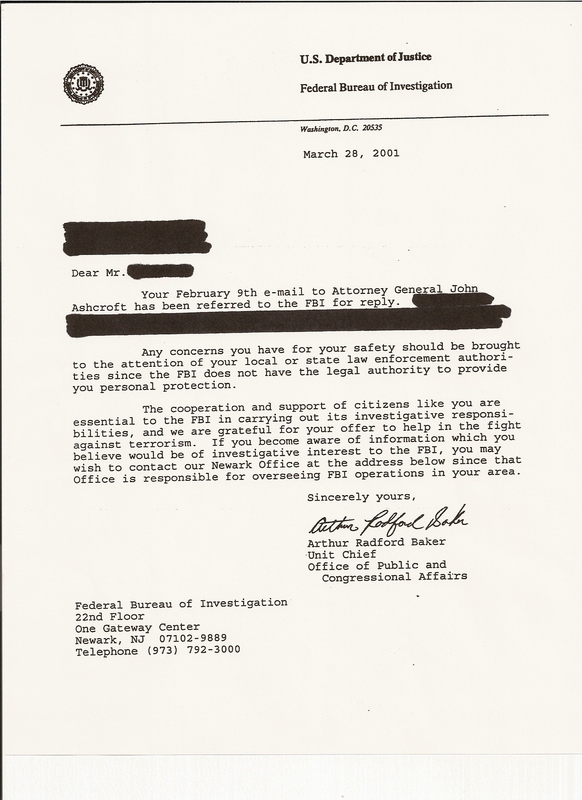 The Legal Unit of the FBI then decided that Haas needed to file a Freedom of Information Act request. 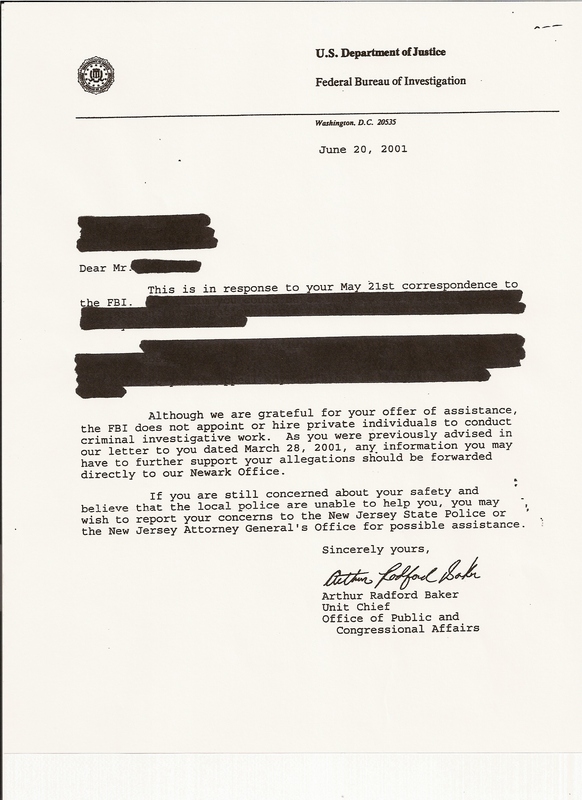 At this time Haas learned that his enquiries had been elevated to the FBI national press office, indicating that the bureau was well aware of how important the story is. Haas has also received also received copies of contact cards that Agents Gritz and Stengel left with the source on June 26, 2001. Haas is now working on submitting the FOIA request to further corroborate the story. He is also urging his source to go public with his information. "What's interesting is that after the event, after 9/11 nobody at the FBI came back to this guy, nobody came back to him to say 'hey maybe we missed something, can you tell us what you knew?' which in his mind confirms that this thing isn't the way the government told us." Haas said.